Take your time reading this piece from Robert W. Lang. 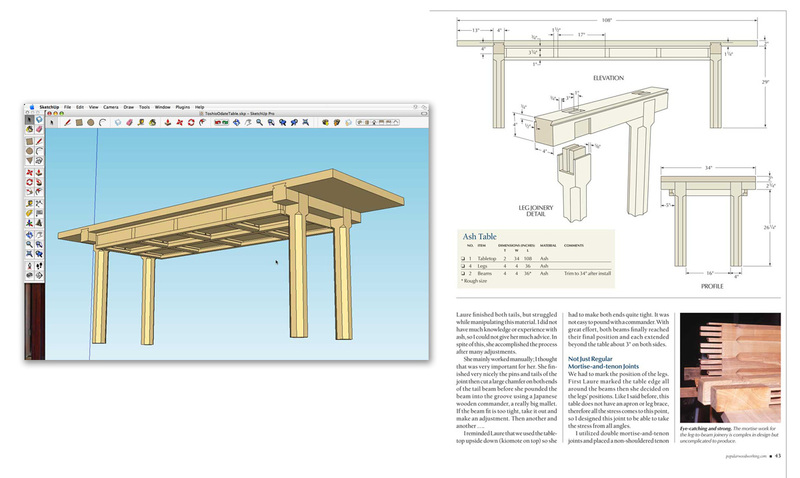 He's not only the executive editor at Popular Woodworking Magazine – he's also an accomplished SketchUp modeler who's just released an e-book on DVD. His Woodworker's Guide to Google SketchUp includes no fewer than 49 videos in-line with the text; that's hands-down the best way to learn, in my opinion. Popular Woodworking Magazine was previously featured in this blog for our 3D Warehouse collection of woodworking models. The collection is closing in on 200 models of projects that were featured in articles in the magazine. This has been a great way for us to connect and share with our readers, but the story of how this collection came to be, and how we use SketchUp is also noteworthy. We started using SketchUp as a tool for planning before we realized its potential as an illustration tool. High-quality technical illustrations are an important part of our publication. Our readers are mostly hobbyist woodworkers and we need to communicate to them detailed information so they can build the projects that appear in articles in Popular Woodworking Magazine. Each project article includes detailed construction drawings that begin as SketchUp models. We work with a limited amount of space and on tight deadlines so we face some challenges to produce usable, accurate drawings in a short period of time. Before we switched to SketchUp, this segment was a major headache for our editorial staff. We used the services of an outside illustrator, and needed to provide detailed information to him well in advance of our deadlines. If the illustrator didn’t understand the construction details, if changes were made during building a project, or if errors were found at the last minute we became bogged down in communicating and correcting these issues. The simplest change could involve several phone calls or e-mails and take a lot of time in the face of a rigid deadline. Then we discovered SketchUp. We began using SketchUp to plan our work. It was faster, more accurate and more flexible than the CAD systems some of us had been using. The editors on our staff who were not experienced in CAD quickly caught on and were soon producing accurate models instead of sketches on paper. The ability to “build” a piece of furniture on the computer before heading to the shop made our limited shop time more productive and greatly reduced planning errors. We had a common well of information to use as a basis for our technical illustrations. We also used Scenes in SketchUp to visualize how the finished illustrations should best appear in print. The right point of view can make or break an illustration, and this was one of the hardest things to communicate to our outside illustrator. With SketchUp we could show the angle we wanted and make our own exploded views. Our art director began using the SketchUp model to plan photo shoots for projects that hadn’t been constructed. It’s a lot easier to move around a model than it is to move actual furniture and lights in the studio. It became clear that we were on the right track, and that we were close to being able to do our illustrations ourselves. I began to experiment with exporting .dwg files from SketchUp Pro, then adjusting things like line weights, fills and text in Adobe Illustrator. In a brief period of time, I developed a system to make this a simple process. We have since developed standards and templates to use in Adobe Illustrator, and all of our staff is now either doing, or learning how to do their own finished illustrations for publication. We are a small staff, and our editors wear many hats. We design and build our own projects, do our own photography, and edit and produce drawings for projects from outside authors. SketchUp has enabled us to reduce the amount of time we spend planning projects and producing illustrations, while improving the quality of our illustrations. In addition to the time saved initially, changes can be made and problems can be solved in minutes instead of days. Thanks to SketchUp, we have more time to build and write, and far less stress in our production process. With the addition of solid modeling tools in SketchUp Pro 8, things will only get better.